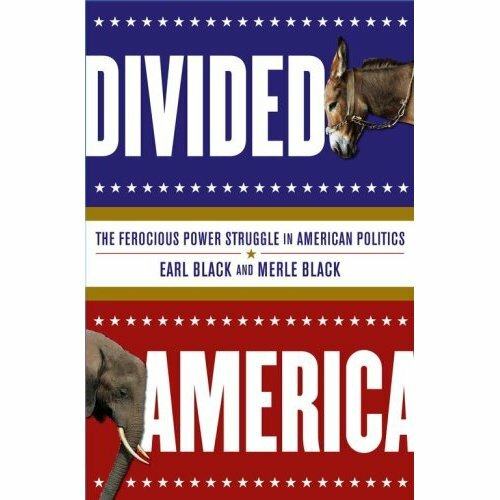 In Divided America, brothers and fellow political scientists Earl and Merle Black attempt to explain the history of national election trends since the Civil War and identify regional and ideological trends that now leave America philosophically and politically divided. The authors illustrate how the “Battlefield Sectionalism” that has defined American politics and national elections since the Civil War has recently given way to a “new American regionalism.” The result is a pattern of conflict in which both ultra-competitive minority (Republican and Democratic) parties possess two regional strongholds, with the Midwest acting as a determinant swing region. After the 1860 election of Republican Abraham Lincoln; the Civil War; and the practices of the Reconstruction, the North was largely Republican and the South thoroughly Democrat. Southerners maintained their animosity and hatred of the North and the Republican Party that had freed their slaves and imposed Reconstruction. The Democratic Party dominated the South as a political vehicle and expression of hatred toward the Republican North. “Battlefield Sectionalism” was born, defined by the brothers Black as “a concept that emphasizes the rigid connection between the geography of the Civil War and the subsequent Republican and Democratic strongholds, [which] molded the American party system for generations” (32). Following Lincoln’s example, Republicans recognized that the North’s immense size was the key to national electoral success, and as long as they could carry two-thirds of the electoral votes/House seats/Senate seats, the party could discard the South and still be assured of victory in any/all of the institutions. Despite the fact that Republicans never dominated the North to the extent that Democrats dominated the South, the North, as it was then geographically known, was three times the size of the South (former confederate states), and this size advantage, combined with the Lincoln Strategy of 1860 of attacking the South to unify the North, served the GOP for 70 years (33). Battlefield sectionalism first collapsed in the North during the Great Depression. The Roaring Twenties and prosperity under Coolidge forgotten, the Republican Party, in power under Hoover, was held responsible. This blame toward the Republicans, combined with public support of FDR’s New Deal programs, led to Democratic emergence as the majority party in the North. Although Democratic leads in the North subsided into a slim lead, they combined with Democratic dominance in the South to ensure national Republican defeats. This Democratic dominance endured until battlefield sectionalism progressively died out in the South due to the Conservative/Republican realignment of the region. The increasing social liberalism of the Democratic Party, coupled with Ronald Reagan’s conservative appeal, facilitated a complete partisan overhaul of the South. For 100 years after the Civil War, the South was solidly Democrat. Now it represents the most reliable Republican stronghold. The authors explain that as Battlefield Sectionalism collapsed, ideological differences increasingly divided the North. Earl and Merle Black break down the North into four regions: the Northeast, the Midwest, the Mountain Plains, and the Pacific Coast. The GOP claims the South and Mountain Plains regions as electoral strongholds, offsetting the sustained Democratic advantage in the Northeast and Pacific Coast. This leaves the Midwest as the swing region, with the capability to very frequently determine outcomes of national elections. The Blacks’ regional approach is supported by recent election results, mainly those in the 21st century, in the institutions of the presidency and both chambers of Congress. Focusing on the presidential elections because of their winner-take-all clarity, the 2004 battle saw the Republican candidate, President George W. Bush, win all 221 electoral votes possible in the two Republican stronghold regions of the South and the Mountain Plains (159). On the other side of the spectrum, Democratic nominee John Kerry won 98% of the electoral votes possible in the two Democratic strongholds of the Northeast and the Pacific Coast (only Alaska defected). With each party carrying its strongholds virtually unanimously, the Midwest was left to once again decide the presidency. Merle and Earl Black contend that the system of regionalism collaborates with increased ideological polarization to create an extremely divided political arena, pitting conservative against liberal, Republican against Democrat, and region against region in a ferocious struggle to gain often short-lived control of the presidency and Congress. Though deeply based in election poll data, the book does not drown one with numbers, and the authors’ analysis is clear and understandable. Further, their explanation of the trends in American election history since the Civil War and increasing ideological and regional polarization is highly interesting.